A polish brand I don't review much, but like is Avon. I was more into Avon polishes a few years back when a friend of mine was a rep. I bought a handful and really enjoyed their offerings. This was one of the colors I bought back then and I think it's a really unique color considering it's from Avon! 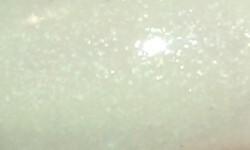 Honeydew Dazzle is a pale honeydew green with clear glass fleck shimmer. Color: I love this soft pale green shade. This is so summer for me. Greens can be kind of tricky on me, but this one is awesome. What makes the shade even better is the glass fleck shimmer added. It really adds a pretty effect that makes it look like it's glistening in the sun. Formula: The formula on this is OK. The formula on this is a bit streaky and uneven. I used 3 coats above. It's not the worst formula I've ever used, but it's not ideal either. You can tell in the photo despite using 3 coats it doesn't even out entirely. Price: N/A. I don't think this one is available anymore. Overall: Despite, the tricky formula I really love Honeydew Dazzle. I love this soft green shade and adore the glass fleck shimmer. I love me some glass fleck glitter and shimmer and I want to see more of it! This is a beautiful color that I'm happy to have.